Over the March long weekend, Wheatbelt NRM hosted a community adventure, which was part of a focus on micro-bats and other native fauna. Nature enthusiast, Joe Tonga, helped community members build bat-nesting boxes at the Quairading CRC, before heading out with more than 50 participants into the bush for a night-time bat stalk through the Quairading Reserve. The group was armed with thermal imaging scopes, ultrasonic bat detectors and military style night vision star light scopes. Our Regional Landcare Facilitator, Leigh Whisson, explained that the region was home to about six different species of microbats, including the Gould’s Wattled and Chocolate Wattled bat. “One of the biggest threats to our native bat populations is land clearing, including the removal of those single paddock Salmon gums,” he told the group. “The nesting boxes have been built with a small entrance so no other creatures like foxes, birds or rats can access them. 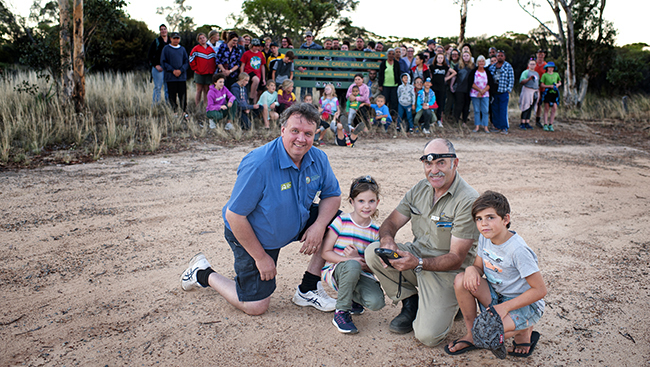 The Quairading Bat Night was funded by the Australian Government’s National Landcare Program.